Ah......Pinterest. I can spend hours on there pinning craft ideas and recipes that I will never make. Who thought that this would be how 30+ year olds get their kicks! Well today I am going to tell you about an under-utilised business tool in Pinterest - secret boards. 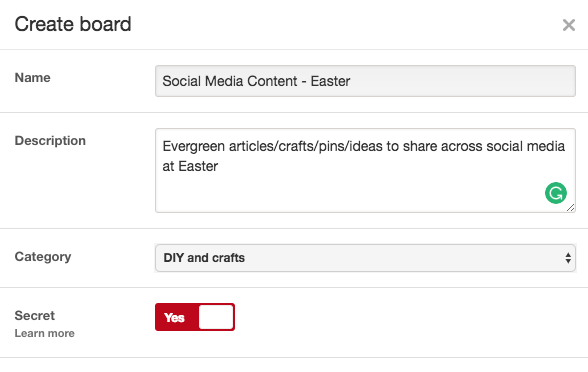 Setting up a secret board is super easy - just click 'create board' and fill in the details as normal. Then click 'yes' under secret. This means that only you can see the board and it's a fantastic way to keep evergreen content all in one place - you can even come back to it year after year. I kind of think of my secret Pinterest boards in the same way that teacher's think about their lesson plans. 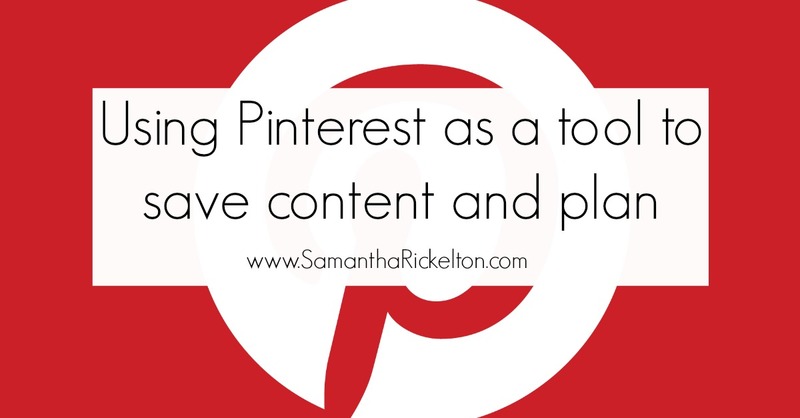 You can create secret Pinterest boards to keep your content ideas together for absolutely anything. The beauty of Pinterest is you can add to it whenever and wherever throughout the year and then when you need to head back to it and start planning your content for the month ahead, all of your ideas are in one place. Remember you can pin from external sources as well as Pinterest itself. Of course you don't need to keep your business planning Pinterest boards secret, you can make them public if you wish. I just prefer to keep my plans secret and pinning Easter posts in December might look odd to my regular Pinterest followers. You can follow me (but not my secret boards - hehe) on Pinterest here. Let me know if you have any ideas for a secret board or if you use this function yourself. That's a good idea. I use mine if I'm having a big planning binge too for a new trip, for example- I pin everything to a secret board then make it public once there are about 40. Someone recommended it once so you don't suddenly seem to spam everyone with dozens of pins but you don't have a live board with 4 pins if you have the content scheduled. I'd forgotten all about secret boards, Sam -- what a great way to utilise them. I need to do more on Pinterest -- I know what a traffic driver it can be.